After his victory in the presidential election in Brazil, the right-wing populist Jair Bolsonaro has announced a radical policy change. “I will change the fate of the country,” said the ex-military on Sunday. “Now flirt with socialism, communism, populism and left-wing extremism.” However, the ultra-right ex-military was also conciliatory. He spoke of a “Brazil of different opinions, colors, and orientations.” In the hard-fought election campaign, Bolsonaro had vilified minorities and leftists and raved about “purges”. While his followers in Bolsonaro see one of the few honest politicians to clean up corruption and crack down on crime, his opponents see him as a threat to Brazil’s fledgling democracy. The former paratrooper is considered a sympathizer of the military dictatorship. “Our government will be constitutional and democratic,” he said. 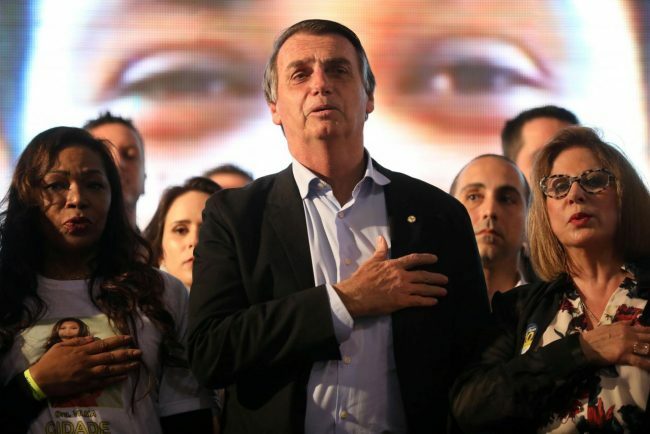 After his victory in the presidential election in Brazil, the right-wing populist Jair Bolsonaro has vowed to defend “Constitution, Democracy, and Freedom”. That was not the promise of a party or the word of a man, but “a vow to God,” said the 63-year-old ex-officer on Sunday in his victory speech. Bolsonaro had clearly won the presidential runoff on Sunday. After counting almost all votes, the “Donald Trump Brasiliens” came to just over 55 percent. His left counterpart Fernando Haddad of the Labor Party (PT) came to just under 45 percent. He announced on Sunday that he wanted to defend the “freedoms” of Bolsonaro’s opponents. At the same time, he demanded to respect the “45 million voters” who voted for him.